This is not a true 'before' because it doesn't show the parkay flooring or the blond colored paneling - with plastic shelves lining the walls. I believe I tore the shelves down within mere seconds of taking ownership of the house. The white walls are new drywall we installed. Also, you can see the old porch railing (wasn't original) before the wrap around porch was put in. 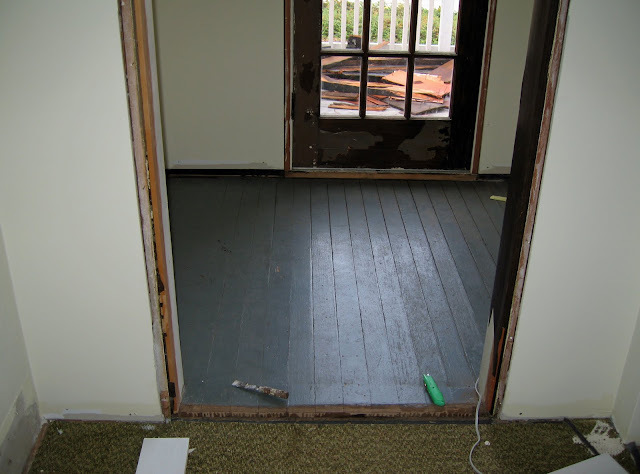 The parquet flooring was removed down to the tar paper, which you can see above. 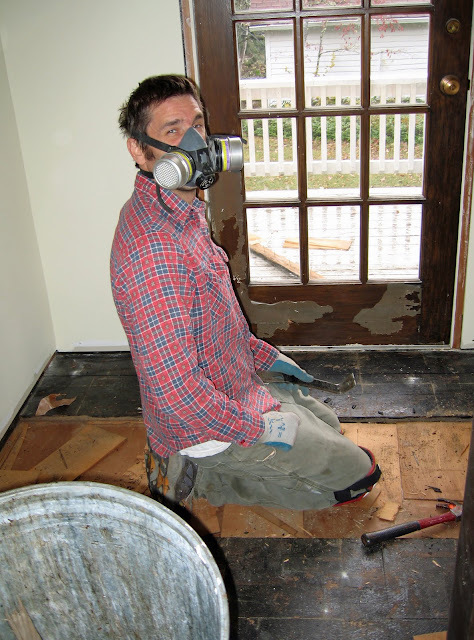 Then we got to thinkin' that perhaps there was another layer beneath the plywood. Hmmmm. We suspected that the room was probably a covered porch that got closed in at some point, so we really didn't know what we'd find. Ta da! 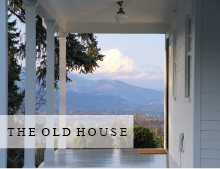 The classic porch gray paint confirmed our suspicions of this once being an outdoor porch. The entry is off from the living room so we painted the walls the same color and also matched the casement window to the large casement windows in the living room (all new Marvin windows). So the rooms although separate, blend well with each other. 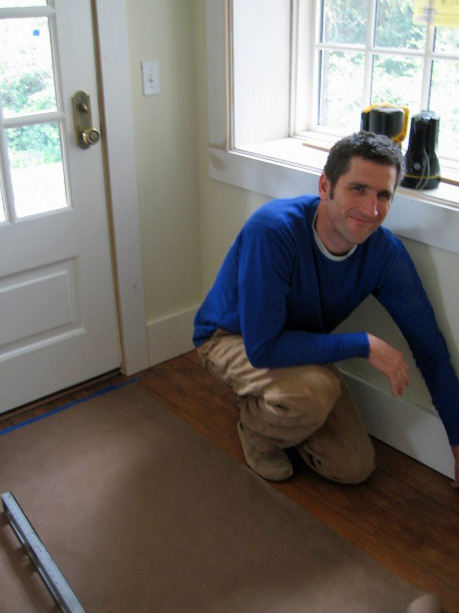 Here is hubby (the cutie pie that he is) putting in the last of the base trim. You can see that the floors have been striped and refinished to match living room floors. Also, there's a new door (Simpson) and a new window (Marvin). The window has a great view of the mountains and countryside so it's a nice preview to the larger windows in the living room. I found this old Victorian hall tree on one of my excursions into the 'big' city. I was originally looking for something a bit more informal but it was such a good price and such a fine example of great Victorian craftsmanship, that we decided to get it. 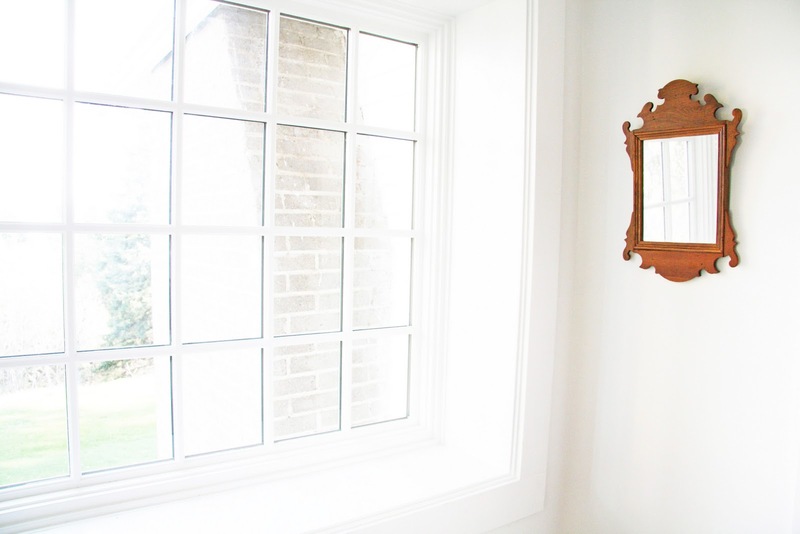 It's also pretty cool that you can look into the hall tree mirror and see the view that's outside the window. The entry is nice and sunny thanks to a large picture window. OMG - My hall tree is very much like yours. . . . darker marble and the hat pegs are a bit different - otherwise the same. So glad I stumbled up your blog - am lovin' it! What a difference the floors make I love the colour. Its great to have a man who does, I'm afraid I have a lovely man but unfortunately he doesn't, so I have to! The Hall stand is beautiful its great to pick up those pieces that you really love, its what makes a house a home! I picked up a few goodies at the junk sale yesterday...too good to resist. I am looking forward to looking thru more of your blog. 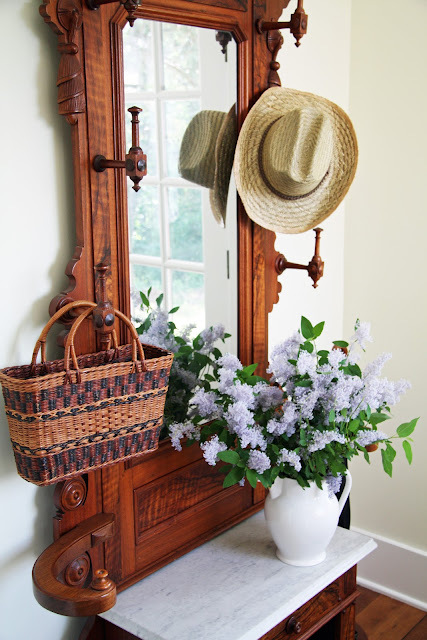 Your farmhouse looks beautiful. Love your blog! But it's parquet flooring, not parkay (which comes in a tub).